The Dreamcast launched during that transition period between old, 15khz only TVs and newer, high definition TV displays. Like many consoles from that time, it supports 240p, 480i and 480p resolutions, compatible software and hardware permitting. Unlike any of the other competing sixth generation consoles however, the Dreamcast opted for a VGA style output connector in order to output 480p. Gamers who wanted to use 480p output on their compatible TVs or monitors simply had to buy a specially designed VGA cable or adapter box. Interest in the Dreamcast remains strong in the Retro-gaming community and naturally those of us still using and enjoying the hardware want to get the best picture from it. 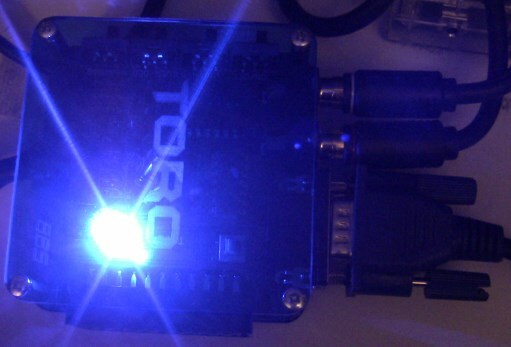 Enter the Toro VGA box, from Turkish based website Beharbros.com. This replacement VGA box not only provides all the functionality of the original Sega VGA boxes, but also introduces several new features that will be of interest to Dreamcast enthusiasts with the latest in retro-gaming gear. Toro, but no bull here! The Toro itself is a square shaped PCB housed in a simple plexi glass case. The plexi-glass only covers the top and bottom of the unit, with the sides of the device left exposed, though we don’t anticipate this being a problem for most people. The plexi glass has a slight blue tint to it and a cool looking etched Toro logo on the top. On one side of the unit there’s a bank of four switches, while another side features a SCART socket. There’s also a VGA/D-SUB15 connector, analogue audio output connectors and a connector that accepts the cable that connects to the Dreamcast itself. When connected to the Dreamcast, there’s a bright blue LED that glows through the case, this light is so bright it can be dazzling when you’re trying to read which switch is which, though it can easily be covered by a fingertip. Connectivity wise, the Toro VGA box solves a number of problems that are inherent in the original Dreamcast VGA boxes. Sega’s decision to use a VGA (or D-SUB15 to give it its proper name) connector for 480p has some consequences for those of us still using the hardware these days. Unlike component video, which was more typically found on consumer television sets, D-SUB15 connectors were more commonly found on computer monitors. By 1999, most computer monitors had already stopped supporting 15khz screen modes (240p and 480i). Because of this, Sega simply locked out 15khz modes when the VGA box was in use. If your game was incompatible with VGA you had to disconnect the VGA box and re-attach a SCART cable or something similar. Apart from being inconvenient, this often led to wear and tear on the Dreamcast’s AV connector. Of course, these days many of us are using our Dreamcast consoles with scalers such as the XRGB3 or the XRGB Mini Framemiester. These devices are quite capable of processing 240p, 480i and 480p signals. The problem is, 240p/480i is locked out by the traditional Dreamcast VGA boxes. This isn’t the case with the Toro VGA box however. By using the switch on the unit labelled “VGA/RGB”, you can toggle between 15khz and 31khz output. Simply move the switch and reset the console and the mode will be changed, no swapping cables and no fuss. Told you the LED was bright. The Toro also has a SCART connector, which you might have assumed is for 15khz signals only. However, unlike typical SCART connectors this connector is also compatible with 31khz signals. This means you can connect your Toro directly to the XRGB Mini and enjoy either 240p or 480p. No need for the extra clutter of an Extron interface or other similar hardware. Remember that many consumer grade SCART switches haven’t been designed for 480p/31khz signals so be sure to test your switching gear with all the Dreamcast’s output signals. Should you have a more unusual setup, you can force composite sync from the D-SUB15 connector too. To do this you need to carefully disassemble the Toro unit and press a toggle switch on the main board. While this is inconvenient, it’s not likely that you will need to change this option very often. If you’re not lucky enough to own an XRGB Mini, you might have a TV set that accepts 31khz via VGA and 15khz via SCART. You might assume in this setup that the Toro is a great solution for you too, however this doesn’t seem to be the case. If you connect both a D-SUB15 cable and a SCART cable at the same time, the SCART output simply seems to be disabled. You can of course re-enable SCART output by disconnecting the VGA cable, but it’s a curious omission on an otherwise feature complete unit that there’s not a simple toggle switch to select which connector is used for output in this situation. Scanline generators have always been popular with Dreamcast owners. There are a number of games that feature graphics designed for 15khz monitors that are simply line-doubled when run in 480p mode. 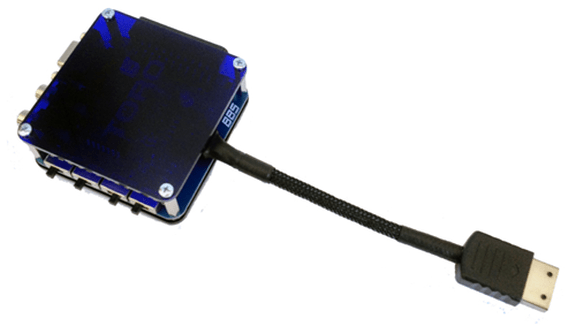 The Toro features a scanline generator built into the hardware. Simply flip a switch on the unit to turn on the scanlines. You can select odd or even lines and also use a double width mode (which supposedly looks better with some scalers). Having the scanline generator built into the hardware is very convenient, sadly there’s no way to adjust the density/darkness of the scanlines, as with an XRGB or the SLG3000 unit. The scanlines you get are reasonably strong, so might be too strong for folks who are used to the softer scanlines consumer CRTs typically give. In use, the Toro gives a perfect bright, noise free image at 240p, 480i or 480p, either via the D-SUB15 connector or the SCART connector. Audio is also handled perfectly with no noise added. The Dreamcast’s VGA output is known to be very good (apart from the squashed picture issue) and we’d certainly have no hesitation giving the Toro box full marks for picture quality. As you’d probably expect, the Toro ships with a cable that can be used to connect the unit directly to the Dreamcast. However, this cable can actually be removed and replaced with a standard D-Sub15 cable. This allows you to connect any VGA source to the unit and use the scanline generator, a neat little bonus. Seeing red or seeing stars? There’s no dobut the Toro is a very well engineered replacement VGA box, which for many users will fix the problems inherent with the original Sega Dreamcast VGA boxes. There are a couple of features we’d change given the chance though. We’d really like to have seen a potentiometer added so that the intensity of the scanlines could be adjusted. The lack of a toggle switch for selecting SCART and D-SUB15 output is also a real disappointment for many setups and is likely to cause confusion for a few folks. If you need a new VGA box for your Dreamcast we’d have no hesitation recommending the Toro. If you already have a suitable VGA box, you’d need to think more carefully before upgrading. Remember that many VGA boxes can be modded to include a 15khz/31khz toggle switch if desired. Toro is an excellent product, easily the best VGA box available for the console, but it falls just short of being the perfect Dreamcast VGA box. Many thanks to Cleeg from the Shmups forum for the kind loan of this unit for our review. Unquestionably the best Dreamcast VGA box on the market. You forgot to mention that nearly ANY modern TV can accept the output from this box using 31khz via a SCART-2-COMPONENT converter, I’ve tested it extensively and it works 100% all except the scanlines which have some issues after being transcoded via component, actually can look better than the XRGBs 480p handling due to false contouring. Good idea and good solution to the “can’t use D-SUB15 and SCART at the same time” issue, though does mean more expense. 480p handling on the Mini isn’t great is it? Yeah it’s not all that impressive, my ~10 year old Sony LCDs scaler beats it in sharpness and with the right settings barely any input lag, 240p is where the XRGB nails it but it’s still a bit finnicky to my tastes (especially with modded PAL consoles) to the point where half the time i just have nearly everything plugged back directly to my TV. The primary benefit of running over Component with the Dreamcast is that you get proper horizontal scaling due to the whacked out clipped 640×480 within 720×480 SMPTE resolution the Dreamcast uses that wreaks havoc with nearly all LCDs via VGA, you’ll never see a jailbar or horizontal scaling artifact via Component. Oh interesting, the component input on my Sony (KDL-40z4500) isn’t very good at all, definitely not sharp. Modded PAL consoles will cause issues on many HDTVs no matter what scaler you use. I’m running a KDL-46XBR45 (KDL-46XBR8 in other countries), thing even handles 240P via ALL inputs with no deinterlacing artifacts once you turn off the DRC chip, picture via 240p is a bit on the blurry side though. It kills the XRGB via S-Video and Composite due to it’s 3D comb filter, haven’t even bothered modding my AV Famicom for RGB as the picture is just good enough to get away with. This sounds really interest. So I would just need the Toro box and presumably something like this http://www.amazon.co.uk/Component-YPbPr-Audio-Scart-Video/dp/B0060HOY5O , and that would allow be to hook up my Dreamcast in 480p to my TV? (which has component, but no VGA). That would be ideal or me! Unfortunately that cable won’t work in this instance, you need something to convert from RGB to component (ypbpr) video. I think the cable simon put in his comment is scart to component. so you cannot use it with the toro box? because I´m thinking to do something like that with my dreamcast. I got my toro box but I’m having problems with the scart output of my tv. It’s SCART to RGBc rather than SCART to Ypbpr. Very few TVs accept component video in RGBc format. Would love to see the same in depth review of the new Akura box.